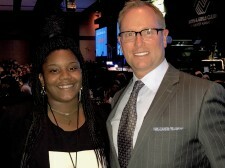 Overland Park, KS, May 18, 2017	(Newswire.com) - ​Keen Wealth Advisors’ Bill Keen, CEO and founder, and Matt Wilson, managing director, as well as their spouses and guests, attended the 21st Annual Kids Night Out Event on April 7 at Overland Park Convention Center, a benefit to support the youth served by the Boys & Girls Clubs of Greater Kansas City. Twelve hundred guests attended the event, which included a cocktail party, silent auction, dinner, live auction, and a performance by the award-winning country group, Little Big Town. Kids Night Out is the largest fundraiser of the year for Boys & Girls Clubs of Greater Kansas City and is rated as one of the top galas in the area. The Boys & Girls Clubs of Greater Kansas City provides a fun and safe environment for kids to learn, play, grow and meet new friends. From sports to education and group activities, the Clubs provide quality programs to thousands of area kids every day, including kids who may otherwise lack the resources for such opportunities. “We had a chance to tour the facilities. The Clubs provide a safe place for kids to enjoy activities like sporting activities and tutoring. After seeing first-hand what the Clubs are doing, we decided to up our support of Boys & Girls Clubs of Greater Kansas City,” said Keen. “The number of children left home alone with no adult supervision has only increased over the past 10 years. That’s why the Clubs are open before and after school, snow days and some holidays, providing a positive outlet for kids during their free time,” said Sharon Cleaver, Director of Marketing, Communications and Public Relations of Boys & Girls Clubs of Greater Kansas City. “Giving these kids a wholesome place to go and some positive guidance is the key to bettering their lives, building their self-esteem, and providing a GREAT future for the kids who need the Clubs the most,” added Cleaver. Matt Wilson has recently accepted a position on the Boys & Girls Club of Greater Kansas City Emerging Leaders Council and is grateful to be able to commit time to furthering the Club’s outreach. Keen Wealth Advisors is headquartered in Overland Park, Kan. CEO Bill Keen is a Chartered Retirement Planning Counselor℠ and independent financial advisor with more than twenty-five years of industry experience. As the founder of Keen Wealth Advisors, a registered investment advisory firm, he and his team specialize in providing personalized retirement planning designed to help people thrive before and during their retirement years. With a passion for educating others, Keen co-hosts "Keen on Retirement" – a podcast designed to provide Keen Wealth Advisors' friends and clients with an additional tool to stay informed and educated on key issues related to retirement planning and investing. The firm also presents retirement planning lectures to employees of many major corporations with a unique specialty in the engineering community. Keen Wealth is largely recognized in the Kansas City region for its educational events focused on retirement planning topics. Bill Keen is regularly asked to share his thinking with national media outlets such as U.S. News and World Report, Reuters, The Wall Street Journal's Market Watch, and Yahoo Finance, to name a few. For more information, visit www.keenwealthadvisors.com. For more than one hundred years, the Boys & Girls Clubs of Greater Kansas City has provided youth, ages 5-18, with special emphasis on youth from disadvantaged circumstances, a fun and safe environment to learn, play, meet new friends and grow. From sports, digital arts and media to group activities and tutoring, the Clubs provide caring adult mentors, friendship, and high-impact youth development programs on a daily basis during critical non-school hours. Priority programs emphasize academic success, good character and citizenship, and healthy lifestyles to nearly 1,000 area youth each day. Whether it is learning how an individual can make a difference in his/her community or learning how to swim, the Clubs strive to help youth feel important and put their dreams of a great future within reach. For more information on how you can become involved in sponsoring or volunteering, visit http://bgc-gkc.org/. Keen Wealth Advisors is a Registered Investment Adviser. Advisory services are only offered to clients or prospective clients where Keen Wealth Advisors and its representatives are properly licensed or exempt from licensure. Past performance is no guarantee of future returns. Investing involves risk and possible loss of principal capital. No advice may be rendered by Keen Wealth Advisors unless a client service agreement is in place.